Perfectly located in Marathon Key, you'll find Tranquility Bay Resort just 90 miles south of Miami and 45 miles north of historic Key West. Marathon airport is less than one mile away, so reaching paradise is easier than you'd think. Here, you'll find yourself amid a grove of towering coconut palms, overlooking the sparkling waters of the Gulf of Mexico. World-class watersports, a private sandy beach, and ultimate relaxation await you at our oasis. View our Detailed Resort Map Here or view local points of interest. Take 836 West to Florida Turnpike South (tolls) to US1, Overseas Highway, to Marathon. 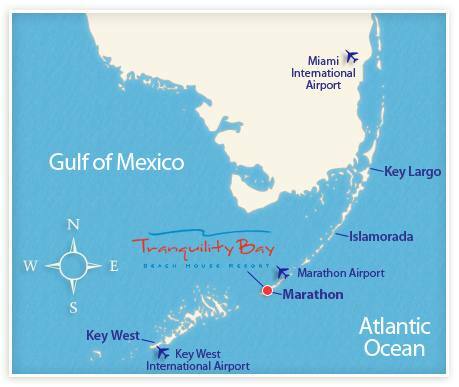 Tranquility Bay Beach House Resort will be on your right (Bayside) at Mile Marker 48.5. Travel 45 miles North on US1, Overseas Highway, to Mile Marker 48.5. Tranquility Bay Beach House Resort will be on your left (Bayside). Turn right out of the airport, and travel South on US1, Overseas Highway. Tranquility Bay Beach House Resort will be approx. one mile on your right (Bayside) at Mile Marker 48.5. Please note, parking for recreational vehicles, boats, trailers and other oversized vehicles is not permitted at Tranquility Bay Resort. Not renting a car? Take advantage of the Marathon, Florida Airport shuttle for an easy way to reach paradise.